Every family needs bonding time, and sometimes that dark, cave-like basement and re-runs of TV sitcoms just aren't enough. Enter the great state of Texas where the sun shines strong, the pools shimmer in the hot afternoons, and the refreshments are nothing short of divine. Whether it's your headquarters for exploring what Texas has to offer, or your home-away-from-home where you spend all your time, staying in one of these 10 family vacation spots will be the best choice you make all year. More than 30 miles of open beaches welcome vacationers of all ages to Ryson Vacation Rentals! Families will flock to this fun center, where the roaming waves of the Gulf of Mexico teem with water-based fun like kayaking, fishing, and a wealth of water sports. Parents can tan on the sun-soaked beach shores while the little ones construct sand castles. Stay dry hiking through the lush landscape, sampling the fare at dozens of exceptional restaurants, and exploring the museums of the Historic District. After a fun-filled day, families can settle into their spacious condo. Sleeping up to 20, the entire clan will be accommodated here. Whether you're on the breathtaking beach or buzzing downtown area, you'll be sitting in the lap of luxury. Sparkling swimming pools, sprawling decks, and gas grills are just the tip of the iceberg here. Round up your family and discover this unmatched Galveston getaway! Set off on a family fishing expedition! Whether casting from off your dock or casting off on a charter trip, you can reel in several species of fish like trout, redfish, and flounder. Galveston is humming with family fun all year round! Stop by for Yaga’s Wild Game Cook-Off, Chili-Fest, or frequent Art Walks throughout the year! Taking in Tanglewood’s golden glow and shoreside location to the glimmering Lake Texoma, it would be no surprise if you considered taking up permanent residence here. The beautiful lake stretches for miles and spans two states. Adjacent to Tanglewood is Hagerman National Wildlife Refuge. Twelve thousand acres of water, wetlands, prairie, and woods are crawling with cute critters and proud beasts. Father and son time has never been this fun with striped bass fishing just feet from your front door. Perfect your swing on Tanglewood’s Arnold Palmer and Ralph Plummer-designed 18-hole golf course. Or, if you don’t feel up to par, an appointment at Tranquility Spa will have you on your feet and in those heels or dress shoes in no time. Especially after being wrapped in pure crushed lavender mixed with lavender essential oil and shea butter. Yeah, it’s going to be hard to leave. Tanglewood is one hour north of Dallas. From Dallas, travel north on U.S. Hwy. 75 and take Exit 69. Turn left onto Hwy. 120 and head west on Pottsboro. At the west end of town, Hwy. 120 makes a hard right; keep following Hwy. 120 and turn left at the resort’s entrance. Continue down the main road for another 2.5 miles until you arrive at Tanglewood Resort and Conference Center. 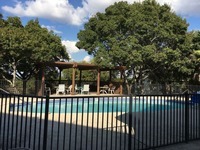 Tanglewood has three outdoor swimming pools, a Jacuzzi, tennis courts, a volleyball court, horseshoe pitching, croquet, Lake Texoma fishing, and the Tranquility Spa for your leisure. 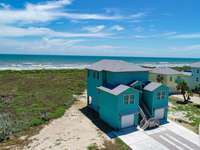 With more than 200 vacation rentals to choose from along the shores of the Gulf of Mexico, Port A Escapes offers the ideal destination for any family vacation, regardless of your travel needs. With more than 18 miles of natural sand beaches, plenty of opportunities for beachfront shopping, world-class deep sea fishing excursions, and some of the finest cuisine in the Southern United States, everyone will enjoy a stay at Port A Escapes, and the city of Port Aransas. Book a tee time at Newport Dunes and Golf, or spend a day splashing around with the kids at Schlitterbahn Beach water park. In addition to all of these great things to do, you'll find the perfect fit when it comes to vacation rental accommodations. With vacation homes ranging from one to eight bedrooms, you'll be able to invite your entire extended family along with you to enjoy great amenities including a full kitchen, flat screen televisions, private swimming pools, and easy access to the beach. Wireless internet is available in most units, allowing you to stay connected throughout your vacation. Don't wait any longer to start planning your next Texas family vacation with the help of Port A Escapes. Dolphin Watch Nature Tours is a local company that helps you to get a close up view of these unique mammals. Whether you plan a tour of the Lydia Ann Lighthouse, or are looking to learn more about the history of Port Aransas and the surrounding islands, Captains Gary and Susan have you covered. Port A Escapes boats three 8-room vacation homes, all featuring private swimming pools and able to accommodate more than 20 people. These units will play the perfect host for your next Port Aransas family reunion! Log Country Cove is the ultimate family vacation destination. Newly constructed Canadian douglas fir log homes are as beautiful as they are sturdy, and just a moment’s walk from the glistening Lake LBJ. Any one of the 45 constructions will serve as an amenity rich headquarters for your Texas family adventure. Make family memories last with many photo opportunities of nature, wildlife, and each other! The pretty property is filled with activities to try. Dive into watersports like jet skiing, boating, fishing, or swimming. Tired out vacationers will coo at the sight of a big TV set and freshly barbequed meal. Thank dad and his perfect grilling skills for that. Swing off the rope swing and splash into family fun here at Log Coutnry Cove. Waterfront views are undeniably gorgeous at Log Country Cove, settled in the prettiest part of the lake. A dazzling display of wild flowers sprinkled around granite outcroppings encapsulate the area, and live oak trees abound. A fun atmosphere and bright surroundings are very conductive to love swirling in the breeze. The resort is a perfect wedding venue! Amaze and delight your family with a trip to a zoo! "What?" You say, "That pretty normal. I want to take them somewhere memorable!" Well hold your horses! This particular zoo is unique in that you can STAY in it! IF your family loves animals, there's simply not a better resort that The Exotic. This independently-owned and operated zoo safari resort is just as committed to its guests as it is to its over 700 animals (from 80 different species). Their several endangered species can't be seen very many other places, and visitors can enjoy their company and natural beauty. Meanwhile cabins are spacious and full of the modern charms you'd expect from a luxury resort, but lets be honest- you've come for the animals! Tours are led daily, some from car and others up close and personal. It's 137 wooded acres of unparalleled fun! Friendly, clean, active – what more could you want f or a family vacation? It turns out, a lot more, and Lone Star Yogi campground has it all! From your friendly greeting from Yogi Bear, Cindi Bear, and Ranger Smith to your affectionate farewell, your stay at Lone Star Yogi is sure to be your most memorable campground experience to date. Premium RV sites, primitive camping sites, and lodging are all available to fit your family’s unique style of fun and adventure. Lodging options range from Boo Boo Cabins with mini-kitchens, to the Yogi on the Lake, featuring a full kitchen and three bedrooms. The view is beautiful in each and every direction and the serenity of nature pervades. Family fun never ends when there's two swimming pools, Pine Tree Plunge, mini-golf course, and a Huge Dinosaur Slide! Located in historic Canton, Texas, award-winning Mill Creek Ranch Resort is the perfect place for your next family vacation. Mill Creek Ranch Resort believes that living that resort life is all about a back-to-basics embrace of nature, simplicity, and good old-fashioned country hospitality. The resort is only 60 minutes from Dallas and offers cabin rentals, yurts, RV sites, and tiny house rentals. Mill Creek provides fun for the whole family with their vast array of amenities. Kids can swim in their two designer pools, let out all their energy in the gated playground, or discover the beauty of Mill Creek by checking out a bike. 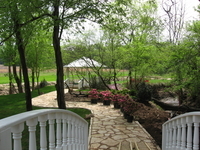 Adults can relax in the spa, do some catch and release fishing on Walden Pond, or bop along to live music while enjoying a cocktail at The Creek. The resort also features several fire pits for s’more making, a nine-hole disc golf course, old-fashioned hayrides, and much more. You and your family should also explore the town of Canton. Downtown Canton, just a few minutes away from the resort, is a great place for families to explore. Pick out an elegant antique or grab a bite to eat at one of their quaint cafes. Grab your kids and go watch the gators feed at the East Texas Zoo or experience history at Heritage Park Outdoor Museum. The population of Canton, Texas is 3,836. You cannot visit Canton without participating in their famous First Monday Trade Days. What started out as a flea market more than a century ago has become home to some of the most exciting, cutting-edge home furnishings, antiques and collectibles that can be found anywhere. The world’s largest outdoor trade days takes place Thursday through Sunday before the first Monday of every month. Show your family how the great outdoors were meant to be experienced at rustic Joshua Creek Ranch! Renowned Texas Hill Country makes for a spectacular backdrop, and Joshua Creek Ranch's uniquely diverse terrain makes full use of it! There's simply so much your family will love, from pristine hunt country and outstanding cuisine to the award-winning lodging accommodations. This is a great place to introduce your family to hunting, whether it be quail & upland bird hunting, European-style driven pheasant shooting, decoyed mallard duck hunting and some of the finest seasonal dove hunting in south Texas. If that's not their cup of tea, well there's plenty of hiking, swimming, and relaxing to be done as well! Like sporting Clays? The resort now features two 10-station courses with scenic views and challenging targets year-round. The lodge is just 45 minutes northwest of San Antonio! Located on over 300 beautiful acres in the Texas Hill Country, Silver Spur Ranch truly offers endless activities and entertainment. Start every day with a hearty breakfast in their 100-seat dining room, then head out and hit the trails! Horseback riding is a favorite here, and whether you're a novice or expert, their staff will assist you in taking one of their beautiful horses out for a slow, relaxed ride. Hay wagon rides are popular with the kids, while adults enjoy grabbing a map from the lodge to explore the wilderness on a hike. Return to Silver Spur at the end of the day and relax by the fireplace in the lodge, or lounge at their spacious swimming pool. Then gather around the campfire and pop open those bags of marshmallows because it's story-time! And once the sky turns black and you can see the silvery stars, you can head to your charming accommodations. Choose from their lodge guestrooms or a cozy cabin, all named after notorious western legends such as Wild Bill Hickok and Jesse James! Experience the best of the west with Silver Spur's fun live entertainment. From trick roper shows to cowboy singers, there's plenty of incredible shows to enjoy. Or, learn how to line dance and two-step dancing during one of their saloon nights! Silver Spur offers fun cookouts during the summer that you're sure to love! Join them for outdoor barbeques and their signature "Cowboy Breakfasts"! Mo-Ranch rests on 500 acres in the beautiful rolling hills of Texas Hill Country- more than enough space for you and your family to have the time of your lives! Paddle down the spring-fed Guadalupe on a canoe, spend the afternoon fishing, or ride a wheeled sled down their 38-foot tall slide right into the water- it's easy to feel like a kid again at Mo-Ranch. The hospitality here is unlike any other, and the staff will do everything in their power to facilitate an unforgettable experience for your family. Meanwhile, you have your pick of a wide variety of lodging options, each laced with rustic touches of Hill Country throughout. Whether you're interested in a hotel room, scenic campground, group lodging, cottage, historical mansion, or private waterfront casita, Mo-Ranch can make it happen! Since 1949, Mo-Ranch has served as a sacred and transformative place for those who retreat to the Hill Country for worship, fellowship, relaxation and renewal. Mo-Ranch also has over 20,000 square feet of meeting space. Grab the whole family and relax in Texas hill country at Mountain Star Lodge in Austin, Texas. Mountain Star Lodge has the best of both worlds, situated in the heart of picturesque Lake Travis while also being close to the nationally acclaimed music scene of downtown Austin. As a guest of Mountain Star, you can enjoy complementary wireless internet, a 43-inch television, and an outdoor swimming pool. You and your family will not be without things to do while at Mountain Star Lodge. Rent a boat at the Lakeway Marina and do some skiing and fishing, shop at the new Hill Country Galleria, or catch a concert at the legendary venue, the Backyard. The population of Austin, Texas is 947,890. In addition to skiing and fishing, the Lakeway Marina also offers golf, tennis, and sailing. If you are a golfaholic, there are five golf courses all within three miles of the lodge! If your family is even in the slightest bit naturally-inclined, they'll find oodles to love at Canyon of the Eagles! Sublimely placed on the edge of Lake Buchanan, Canyon of the Eagles offers all the comforts of a full-service nature resort while still giving guests some of the finest natural tranquility in the country! Once your family has settled into their cozy quarters, you'll want to get out and spend as much time as possible enjoying the great outdoors. There's any number of ways you could do so: hiking in the hills, cannonballing into gorgeous Lake Buchanan, and seeing some native wildlife for yourself chief among them! From deer and bobcats to the eponymous Bald Eagle, it's an unforgettable was to spend an afternoon! The resort is 5 miles from Burnet County Park. Other amenities include an amphitheater, an observatory and an outdoor pool, plus an airy restaurant, and 12,000+ square feet of event space. Vacasa Fredericksburg makes it easy to plan your next Texas family getaway. 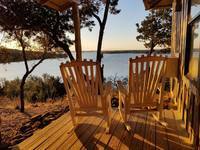 Their charming Hill Country accommodations are ideally located near popular Fredericksburg attractions and activities. You and your family can enjoy a day of outdoor adventure at the Enchanted Rock State Natural Area, which features miles of hiking trails and other activities. You can also visit the Wildflower Ridge Alpaca Ranch, and learn all about alpacas! The Texas Hill Country is home to over 45 wineries and vineyards. Fredericksburg is the epicenter of the Hill Country wine region, indulge in a wine tour, or if you prefer Main Street is home to an assortment of restaurants that go from Tex-Mex to Italian delights! Fredericksburg's elevation is 1683 feet. Mountain biking enthusiasts will enjoy Hill Country State Natural Area. The Texas Hill Country is an unforgettable place for vacations spent with family, friends, and sweethearts. In charming New Braunfels, you will discover a serene, natural landscape and incredible old world heritage that makes it a unique destination for your Texas vacation. New Braunfels Escapes provides you with a selection of perfect accommodations to choose from that are beautifully furnished, well-maintained and equipped with all the comforts of home. Full kitchens, cozy living spaces with flat-screen television, private decks or patios, wireless internet, and much more is available to ensure you feel right at home. When you're not lounging indoors, head out to explore this fantastic area at your leisure. Landa Park is a 196-acre natural park that features an array of exciting outdoor activities. 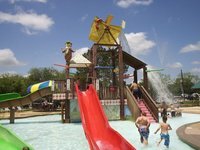 The largest spring in Texas, Comal Springs, is here as well, where you can swim at your leisure. Explore the lake on a paddle-boat or canoe as well! Texas Hill Country is a place for outdoor fun such as hiking, fishing, and swimming. You can visit local caves like the Natural Bridge Caverns, stop by the Animal World & Snake Farm Zoo, or enjoy a historic walking tour of New Braunfels.